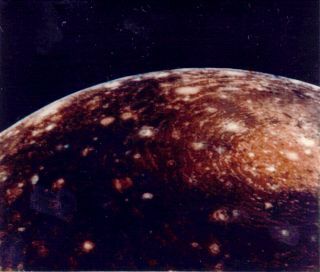 Voyager 1 image of Jupiter's moon Callisto from a distance of 350,000 km. The large ‘bulls-eye’ at the top is believed to be an impact basin formed early in Callisto's history. The bright center of the basin is about 600 km across and the outer ring is about 2,600 km across. Callisto is a large moon orbiting Jupiter. It has an ancient, cratered surface, indicating that geological processes could be dead. However, it may also hold an underground ocean. It's unclear if the ocean could have life in it because the surface is so old. It will take more observation of this large moon to be absolutely sure. The moon has been a subject of several flybys, including the long-running Galileo mission at Jupiter in the 1990s and 2000s. An upcoming mission called JUICE (Jupiter Icy Moon Explorer) will focus on three icy Jupiter moons, including Callisto, to get more information about its environment. JUICE is expected to arrive in 2030. NASA has a mission at Jupiter right now called Juno. While Juno is more designed to look at the atmosphere and environment of Jupiter, it has taken some images of Callisto from a distance. Several icy moons of the solar system have been a focus of exploration in recent years because of their potential for holding life. The Cassini spacecraft, which orbited Saturn from 2004 to 2017, uncovered extensive evidence of geysers at its moon, Enceladus. Other icy moons include Triton (at Neptune, imaged by Voyager 2) and Europa (another icy moon of Jupiter.) In general, these moons maintain liquid oceans because of the gravitational tug from their large giant planets. When Galileo turned his telescope to Jupiter on Jan. 7, 1610, what he saw surprised everybody. The planet was not alone; it had four moons circling it. At the time, it was believed that the Earth was the only planet with a moon. For two centuries Jupiter's moons were (as a group) named after the Medicis, a powerful Italian political family, according to NASA. Individually they were called Jupiter I, II, III and IV, with "IV" referring to what we now call Callisto. The discovery had not only astronomical, but also religious implications. At the time, the Catholic Church supported the idea that everything orbited the Earth, an idea put forth in ancient times by Aristotle and Ptolemy. Galileo's observations of Jupiter's moons — as well as noticing that Venus went through "phases" similar to our own moon — gave compelling evidence that not everything revolved around the Earth. As telescopic observations improved, however, a new view of the universe emerged. The moons and the planets were not unchanging and perfect; for example, mountains seen on the moon showed that geological processes happened elsewhere. Also, all planets revolved around the sun. Over time, moons around other planets were discovered — and additional moons found around Jupiter. The Medici moons were renamed Io, Europa, Ganymede and Callisto to avoid confusion by the mid-1800s. Age: Callisto is about 4.5 billion years old, about the same age as Jupiter. It is the most heavily cratered object in the solar system, according to NASA. There is hardly any geologic activity on its surface. The surface has not changed much since initial impacts molded its surface 4 billion years ago. Distance from Jupiter: It is the outermost of the Galilean moons. Callisto orbits Jupiter at a distance of about 1,168,000 miles (1,880,000 kilometers). It takes the moon about seven Earth-days to make one complete orbit of the planet. It also experiences fewer tidal influences than the other Galilean moons because it orbits beyond Jupiter's main radiation belt. Callisto is tidally locked, so the same side always faces Jupiter. Temperature: The mean surface temperature of Callisto is minus 218.47 degrees Fahrenheit (minus 139.2 Celsius). While telescopes improved substantially by the Space Age of the 1960s, still little was known about Callisto, according to the 2004 book "Jupiter: The Planet, Satellites and Magnetosphere" (Cambridge, 2007). From what astronomers could tell, the surface looked relatively featureless compared with Io and Ganymede. Callisto also had low reflectivity (albedo) and was known to have a low density, but astronomers saw no evidence of water emissions. This led them to conclude that Callisto had a rocky surface. Galileo images of the surface of Jupiter's moon Callisto have revealed large landslide deposits within two large impact craters. The two landslides are about 3 to 3.5 km in length. Pioneer 10 and Pioneer 11 each flew by Jupiter and its moons in the early 1970s, but these missions didn't give much new information on Callisto beyond what Earth-based telescopes showed. It was the Voyager missions of the late 1970s that really showed us a different picture of the moon. Callisto's density and temperature were refined, and images of the surface showed features as small as 1 kilometer per pixel — in other words, a resolution small enough to spot impact craters. In fact, Callisto was very heavily cratered compared with the other moons, the authors wrote. "Some dismissed Callisto as the most boring object of its size in the solar system," they added. More close-up observations required a wait until 1996, when the Galileo spacecraft commenced the first of 12 flybys of the moon. Galileo's repeated flybys and higher resolution revealed much more information about Callisto than before. More of the surface was mapped, a thin carbon dioxide atmosphere was discovered, and evidence of a subsurface ocean was uncovered. Arguments for an ocean came from two pieces of evidence, according to NASA. First, scientists saw regular fluctuations of Callisto's magnetic field as the moon circled Jupiter, which implied there were electrical currents within the moon stimulated by the planet's magnetic field. That current had to conduct from somewhere, which led to the second piece: due to the rocky surface and thin atmosphere, a likely explanation would be a salty ocean under the moon's surface. In 2018, examinations of archival images taken by the Hubble Space Telescope in 2007 showed Callisto's effect on auroral bursts in Jupiter's atmosphere. Jupiter generates auroras on its own, but some of the phenomena come through interactions with its four largest moons: Europa, Io, Ganymede and Callisto. The signatures of the other moons were previously spotted in Jupiter's atmosphere, but this new research represented the first time that Callisto's effect was found. Callisto and the other Galilean moons may have formed with the assistance of Saturn. A computer model released in 2018 suggested that as Saturn's core grew, its gravitational influence moved planetesimals (baby planets) toward the inner solar system. This process might have provided enough stuff to form the four Galilean moons. If Callisto is habitable — and how it formed that way — are among the outstanding questions that the JUICE mission will start studying. JUICE is slated to launch toward Jupiter in 2022 and work at the planet for at least three years, between 2030 and 2033. JUICE will focus on the moon Ganymede, but its science objectives for Callisto will be similar. This includes looking for ocean layers or water reservoirs, mapping the surface, looking at the atmosphere and figuring out what Callisto's interior looks like. Recent scientific papers include modeling how Callisto's and Jupiter's magnetic fields interact (the study provided more evidence for a subsurface ocean on Callisto) and finding atomic oxygen in the atmosphere using the Hubble Space Telescope. Other papers have focused on aspects such as the possible water under its surface, refining the crater counts on its surface, and atmospheric investigations.